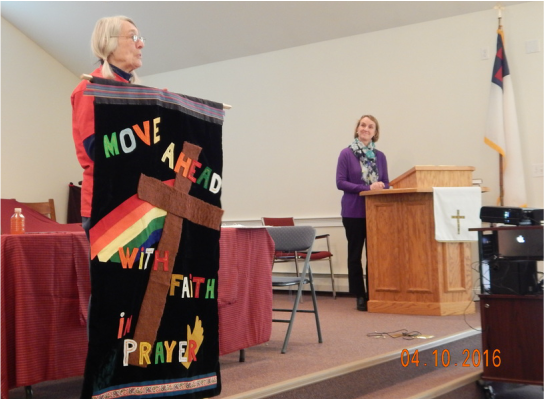 Barbie Peterson presents BMCC with a new banner as Sue Dunn watches from the pulpit. Many thanks to all who took part in our tenth anniversary gala! The resurrected BMCC players certainly showed they weren't dead and have not lost their ability to make folks take notice. I especially want to thank the banner presenters. Their messages to all of us were worthy of several Sunday morning talks. How fortunate we are to have all these caring folks in our midst. God is good ( all the time). 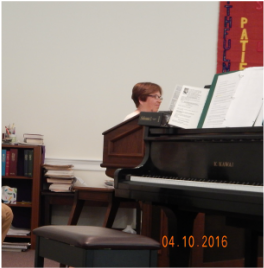 And the music-we are certainly blessed by our choir, Doug, Alexander, and Angela. There will be more from all of them! That brings me to the future. Yes, it is in God's hands but we cannot sit on our hands and wait for things to happen. We must talk among ourselves, bring up ideas, make suggestions, and ask questions--all in prayer with faith that we hear and heed that which we must do to promote His will. The music committee is brainstorming for a design along that line. Already someone outside the church has suggested that we get together a Community Choir to perform a Christmas cantata. It is never too to promote is idea to the local churches and community. Speak to a council member or better yet come to a council meeting and bring your ideas for any musical event or ideas for community needs. There must be some blessings out there looking for a way to meet someone's needs that BMCC can help get started. 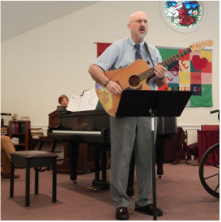 What a wonderful 10th Anniversary celebration we had at our Bar Mills Community Church. 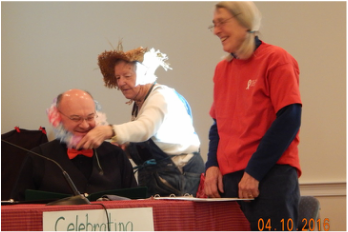 The BMCC players; Barbie Peterson, John Myers, Lori Dorey, Pam Peiffer, Mimi Bourque and Rita Anderson treated everyone who attend to a skit talking about the move from the little church by the river to its current location today. Everyone did a fantastic job and Rita Anderson stole the show in her true artistic fashion. 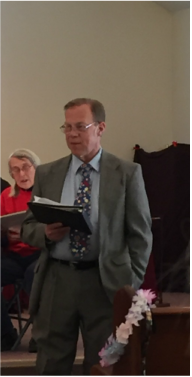 We were also treated to many musical talents; June Tardiff on the organ, Doug Hajjar on the guitar who also sang one of his own original songs, Angela Olszta on the piano and Alexander on his violin treated us to a duet and while the choir with their beautiful singing blessed us many times during the celebration. We are so blessed!